Do you have a Tucson property you want to sell? If so, you will likely want to save money wherever you can! In our latest post, we will help you learn how to save money when selling your home in Tucson! Selling a Tucson house the typical way can get expensive! Before you know it, you will have a stack of bills before the property is even listed. Make sure you consider all selling method before signing a listing agreement with a local Tucson real estate agent. In some cases, it may not be the best decision from a financial standpoint. Consider all of the costs of a Tucson listing before signing any agreements. Make sure yo are making the smartest decision for your Tucson house! By selling your house as-is to a local investor, you will save not only on commissions but on repair costs too. Not all property buyers are the same. 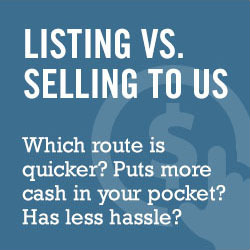 Make sure you are working with a reputable company such as We Buy Homes In Tucson to ensure a quick and easy transaction. When you work with us, there are no repairs, cleaning, staging, or storage costs. Plus, by selling as-is, you won’t have to worry about negotiations after the home inspection process. When you think of all the costs involved in listing your Tucson house, you will want to make sure that the money you are spending, will provide the biggest bang for your buck.